Mahatma Gandhi's Announcement of a Design Competition, 24th July 1929 One Lakh Rupees or 7700 Pounds Prize! Akhila Bharatiya Charkhaa Sangh Worker's Samiti has decided to organize this contest for inventors and engineers all over the world that if they could come up with a Charkha or a Samyukta Yantra which - for making the thread and cloth that satisfies the following criterion - shall be awarded prize money of 1 Lakh Rupees or 7700 pounds. 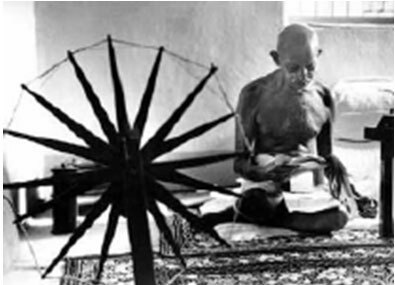 Charkha must be light-weighted, easy to move, and it should be in such a way so as to be operated using either hand or one's leg in a natural way in the rural cottages of India. It must be in such a way that a lady shall be able to work with it for eight hours at a stretch without great effort put in. Either Charkhas must have a build to accommodate the use of a puni (used to make handspun cloth) or along with the charkha there must be a way to handspun cloth. On working with the charkha for eight hours at a continuous stretch - it should result in 12 to 20 numbers of 16000 feet yarn. The machine should be so designed such that it costs no more than Rs. 150 in producing it in India only. The machine should be strong and well-made and with time-to-time servicing it should be capable of running for at least 20 years without any stopping. Servicing of the machine should not cost much and every year not more than 5% of the cost of the machine that year shall be needed for servicing. All those taking part in this contest may, with their own input costs and expenses, send their machines to Sabarmati Ashram before or not later than 30th October, 1930. In case the machines satisfy the criterion mentioned - then the inventor/designer can patent it on his name to protect their rights on them. But, if they wish to become eligible to win the prize money of the contest, then the designer shall have to transfer the rights of the patent to Indian Charkha Sangh Council. The Judges for the Contest shall be Khadi Pratishtan's Sri Satish Chandra Das Gupta, Bardoli Swarajya Ashram's Technical Director Sri Lakshmidas Purushottam and Tiruchengonduu Gandhi Ashram's Director Sri Chakravarthy Rajagopalachari. In case there is no consensus amongst the judges on the winner - Gandhiji's decision shall be the final one. In case of Gandhiji's absence Akhil Bharat Charkha Sangh Mantri Sri Shankar Laal Banker shall be the final decision-maker. All questions and queries may be addressed to Mantri, Akhil Bharat Charkha Sangh, Mirzapur, and Ahmedabad." Present value about Rs. 10 crore. Do we lack the resources? Why do we live with the problems unsolved for so long ?